Mobile messaging apps have become the heir-apparent to SMS, but what about calling? Some apps dabble in voice and video calling, but their usefulness relies on the other party downloading and using the app, while the quality of calls is often sub-par. Step forward Maaii, a Hong Kong-based service that blends the telephony focus of services like Skype with the social approach of chat apps like WhatsApp and Line. Like the Skype-out service, Maaii enables calls to regular phones across the world directly from the app. Users can purchase calling credit, as they do with Skype and SIP-based services, or alternatively earn it by completing tasks such as inviting friends to join, rating the app and more. I earned $0.30 just by filling in my profile and was pleasantly surprised that a three minute call to a UK landline cost just $0.08 — while the quality of the audio was on par with a regular phone call. The app includes all the usual features of a messaging apps too. When connected to the Internet, users can send unlimited text chat messages, share images, emoticons, stickers and push-to-talk voice messages. There’s even Snapchat-like photo messages which expire after 10 seconds. The app also connects to Facebook to let you find and chat with friends from the social network. That’s very useful, but Facebook yanked the very same feature from MessageMe earlier this year so it isn’t clear if it can remain in the long-term. That the app leans on telephony and has a Skype-style feel to it is no coincidence since Maaii is privately-funded by a Hong Kong mobile operator and led by Chris Lewis, who was formerly head of Skype in Asia. Lewis tells TNW that the app has “millions” of users and is most popular in Asia — particularly China, Hong Kong, Malaysia and Thailand — and is charting growth in Middle Eastern markets like Saudi Arabai and Kuwait, where established apps like Viber are banned. In a sign of its potential, Maaii added 500,000 new users in Thailand within 24-hours of introducing Thai language support. That could include customized video calling messages — which display when a call is incoming from a particular contact — in-app sound effects and more. 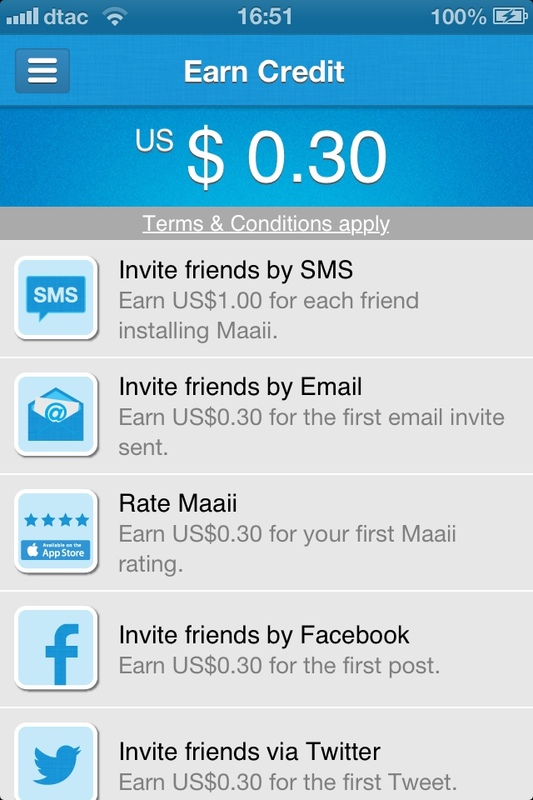 Maaii is also moving towards a system that will reward users with calling credit when they engage with content, such as advertising or third-party game downloads, although that is a little further off. Maaii’s background and focus on telephony services gives it a clear differentiator to the rest of the messaging market, and Lewis is confident that the app can co-exist with the likes of WeChat, Line and Kakao Talk, which boast user bases in excess of 300 million, 200 million and 100 million respectively. The app feels like a mobile-first version of Skype, and for that reason I think Maaii is well worth an exploratory download.